I thank the radiation oncologist’s office staff for underscoring the twin pleasures of labor. That is, being fully engaged in your work and knowing that it is fully appreciated. Plus, I wish to celebrate a profoundly dedicated working woman on this Labor Day 2012, in the same tradition of James Agee and Walker Evans. I was taking my elderly Mom for a check-up; she is a survivor of brain cancer. On the top of the reception desk, there was a stack of duplicate letters from a former employee. I transcribe the letter below. It will bring you back to Ground Zero for gratitude, as it did when I read it. 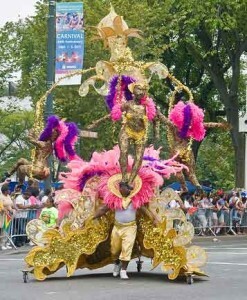 The place where I will be this Labor Day 2012: at the West Indian street parade. Due to illnesses in my family I am making necessary life and professional changes. I am leaving my position as Nurse Practitioner with Dr. Harrison, effective this week. I am moving out of state, to be nearer family. For now, I plan to take 3 or 4 months off from full time work in order to help when needed. After that, I’m not sure … maybe teaching? I want you to know that working with you while you went through radiation was an honor and great privilege for me. The nature of our work together allowed me to become very close to you, very fast. You allowed me in, close enough to be able to help you and I thank you for your trust. Your strength and courage during the treatment inspired me. You’ve helped me keep my priorities straight by showing me that family and loved ones come first, and to truly take life One Day At a Time. Leaving you and leaving Dr. Harrison is one of the harder things I’ve ever done. But we have found a wonderful Nurse Practitioner to work with you, and you have the best doctor always looking out for you. I hope you always have health and happiness in your life. And again, thank you for all that you’ve given me. Recognize there are few rewards in a career that surpass the knowledge your work is valued. If you are a business owner, think back to the last time you expressed appreciation to your employees. If it was more than two weeks’ ago, say something again. If you are a worker, take stock of how you can enhance the experience when customers connect with the business that employs you. Indeed, you are in a unique position to be that warm and welcoming face of commerce. Don’t squander that opportunity! Photo courtesy of Creative Commons 2.0, Neil e Gibbs. On this Labor Day 2012, what aspect of work are you grateful for? Thank you for this effective “shake up” on Labor Day, Diane; it’s all too easy to fall into a rut of outer indifference, even when we do truly love and appreciate those who share our workdays. I’m awake now … I am surrounded by people who graciously make it possible for me to do what I do, others who provide support as we develop our individual businesses and clients who allow me to share in their journeys. And I do “it” all from a place I adore: my home. Gratitude, pure gratitude. Sharon, I really appreciate how you added your comments… I was right there on Schenectady Avenue and Eastern Parkway, when the email came through. It is amazing how the internet keeps us close, and so easily in touch. And … let’s hear it for working from home, something that I have been sharpening as well!